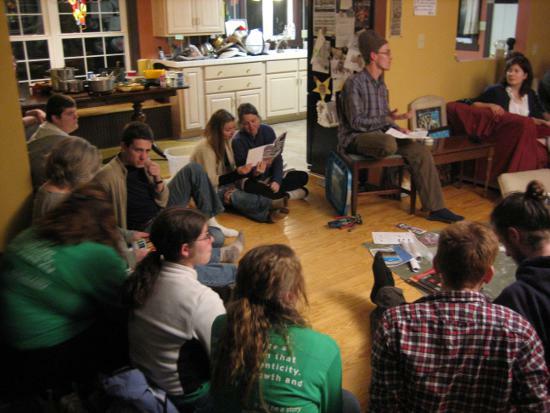 The Bloomington Christian Radical/Catholic Worker is a community based in Bloomington, IN in the tradition of the Catholic Worker Movement. The Catholic Worker Movement lives the vision of Dorothy Day and Peter Maurin, who believed that a peaceable revolution would result if people imitated Jesus Christ's nonviolence (Matt 5:38-48), voluntary poverty (Matt 6:24, 19:16-26), and radical hospitality (Matt 25:31-46). The BCR/CW is an ecumenical Christian intentional community that tries to live, pray and work with each other. We offer housing, food, and love to people facing homelessness. The BCR/CW is autonomous and has no institutional connection to the Roman Catholic Church. We are not a 501c3 and donations are not tax-deductible. We perform the works of mercy and nonviolently oppose the works of war. We strive to practice the Sermon on the Mount, community living, voluntary poverty, personalism, and care for children and the environment. Another house on or near N. Blair Ave. in Bloomington to be used as affordable housing for former guests still in poverty. Check back soon for a page all about how to get involved with the BCW. In the meantime, feel free to email us at bloomingtoncw@gmail.com or call us at 812-339-4456. We would love to talk with you! Faith – We are an ecumenical, Christ-centered, Christian community. Without faith our work seems foolish. We recognize the importance of prayer both in our individual lives and in our communal life. the work of serving others without a healthy community of encouragement and support. We share our space, our faith, our work, and our play. destitution, and the triplets of racism, materialism and militarism. We hope and work for a new society brought about by the revolution of the heart. We hope to begin creating a better, decentralized society within the shell of the old. the works of mercy, for we know that when the Son of Man comes in glory we will be judged solely on how we care for the least of our brothers and sisters (Matthew 25). The corporal works of mercy are feeding the hungry, giving drink to the thirsty, sheltering the homeless, clothing the naked, visiting the sick, visiting the imprisoned, and burying the dead. The spiritual works of mercy are admonishing the sinner, instructing the ignorant, comforting the sorrowful, counseling the doubtful, bearing all wrongs patiently, forgiving all injuries, and praying for the living and the dead. Personalism – We are committed to taking personal responsibility for the people around us at a personal sacrifice. Voluntary Poverty – Voluntary Poverty is the inevitable result of living out the counsel of John the Baptist, that if we have two coats we should give to one who has none (Luke 3). We will try to serve God rather than money and accept that the result may be “downward mobility.” We distinguish between the simplicity of voluntary poverty, which we encourage; and involuntary destitution, which we abhor and against which we struggle. Nonviolence – We cannot reconcile the commandment to love our enemies with the practice of modern warfare. We hope to be peacemakers in our community and in our country, and we oppose the works of war where we find them. Our spiritual weapon is nonviolence, made manifest in protest and civil disobedience. Care for the Environment – We wish to truly live simply so that others might simply live. We recognize our connection to the land and pledge both to be good stewards and make personal sacrifices so that we can treat the earth with the utmost respect and delicateness. We take this, our communal vision, very seriously; nevertheless we recognize that this document may be revised if it proves a clear stumbling block to Christian discipleship. beliefs and are free to dissent from these principles; but these shared values will guide the decisions and direction of the community. one another and build each other up (1 Thessalonians 5). 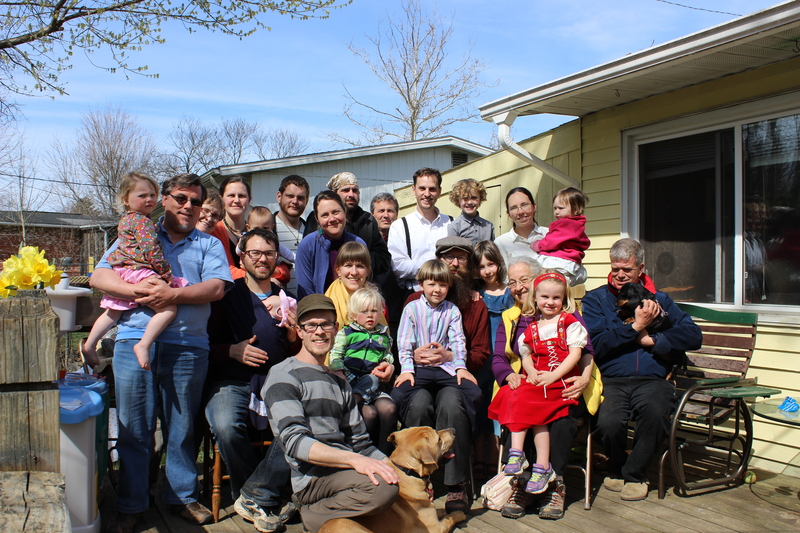 The Bloomington Catholic Worker is currently a collection of four families (8 adults, 9 kiddos) attempting to live out the radical love demanded of us by Jesus in the Sermon on the Mount. We are attempting to “create a new society within the shell of the old”. We are a flawed and sacred experiment, following in the tradition of “houses of hospitality” found within the Catholic Worker movement. We are an independent organization, with no official connection to the Roman Catholic church, whose members share most aspects of life together. This allows for a certain amount of intentionality that we would struggle to create otherwise. In particular, it allows us to offer hospitality (a place to sleep, food, and community) to those in need. Peter Maurin said that we need to work towards a society “in which it is easier to be good.” Living in community allows us to structure our lives in a way that makes it easier to do the “good” of hospitality. We live in three adjacent small-ish single-family homes, using our spare rooms (7 total beds) as spaces for folks who would otherwise be homeless. Because all three houses have children, we require that guests commit to keeping our spaces safe and sober. Although this limits who can stay with us, there is no shortage of those in need who fit within those parameters. The Church has a rich history of offering shelter and material support to those in need. The Catholic Worker movement believes this is best done at a personal sacrifice. Doing this work offers us a unique and meaningful window into the suffering and joy of others that we would not otherwise be present to. We pray that we are shaped by these experiences and stretched to love more. We each recognize (and continually fail to honor) the inner work necessary to have our efforts come from a place of generosity and love rather than obligation and a disconnected sense of morality. To that end, we share a daily morning prayer routine, a weekly reconciliation time, and attempt to carve out space in our days and weeks for Sabbath rest and reflection. We happen to each come from within the Christian tradition and have been particularly influenced by the radical life and message of Jesus. Catholic Workers share Pope Francis’s concern with the modern industrial capitalist system’s preference for profit over people and the environment. We recognize the rejection of individualism and greed as a spiritual practice and as an extension of solidarity towards those who are on the receiving end of our system’s injustices. 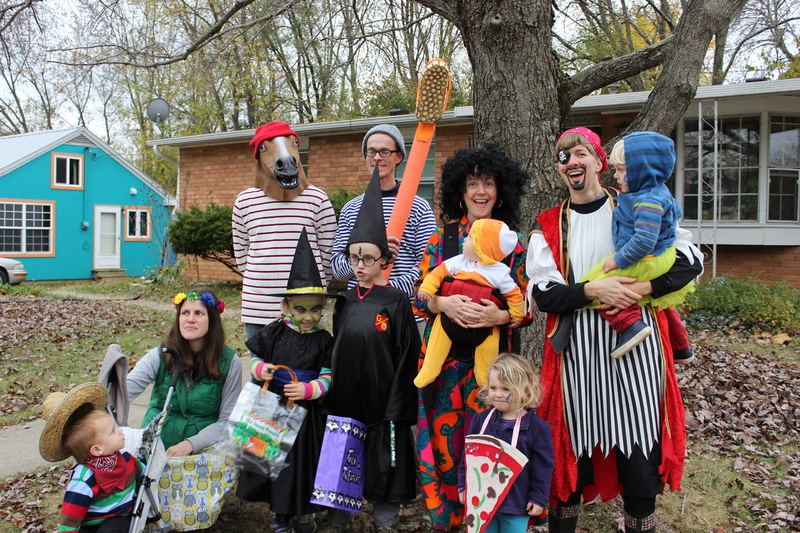 Most of us work part-time jobs in Bloomington (church work, social work, mosaic-artwork, and doula-work) and contribute approximately 50% of our income towards collective expenses such as food, utilities, bus passes for guests and property maintenance. We are also reliant upon the generosity of others (money, jars of milk, hand-me-downs) who support our work. We seek to walk a razor’s edge between “enough” and holy precarity, recognizing that our ideas of “enough” might seem silly to those on either side of where we are. Check out the writings of Dorothy Day, Peter Maurin, Emmanuel Mounier, John Howard Yoder, Stanley Hauerwas, Thomas Merton and Wendell Berry for a deeper look into the spiritual/theological leanings of our own community and the Catholic Worker movement in general. We aspire towards living in harmony with the rest of nature, taking cues from land-and-craft based Catholic Worker communities such as the electricity-and-petroleum-free White Rose Catholic Worker and so many other groups and individuals seeking to live in less destructive ways. We are always looking for ways to reduce our carbon footprint and be more self-reliant. Let us know if you can help us in that regard!